Self-Publishing Costs 2018: The Ultimate Guide. Is it Truly Free? Self-publishing is often portrayed as a free or low-cost alternative for those who cannot get or don’t want to get a traditional publishing contact for whatever reason. But is self-publishing truly free? If you are thinking about writing a book, you have to know in advance your potential self-publishing costs to avoid bad surprises and plan your budget. In this article, we’ll explain how much it costs to self-publish an ebook on Amazon and in other stores, and to distribute your print copy. We’ll explore free, cheap and professional quality options. Self-publishing can be free or cost thousands of dollars. The difference lies in the details: there is no step that you couldn’t do by yourself, but sometimes it is better to hire a professional. If you know in advance what kind of expenses you can expect, you can make your own compromises if you have to. You can decide whether to learn a few new skills and try doing it alone, or ask for professional help. Well, time is money. And don’t expect your book to be ready in two weeks. When writing a book, your time is your biggest cost. Don’t be fooled: writing is hard work. You simply need to sit down and do it. If you don’t want to invest your time, you can try co-writing your book with someone or hire a ghostwriter. Both options could have up-front costs, and can involve splitting your royalties. If you decide to hire a ghostwriter (or if you are a ghostwriter yourself interested in picking up a project), make sure that you sign a contract. It should clearly contain who is the copyright holder and what happens to your royalties. Talking about writing: if you write your own book, you’ll need a writing software. You can use Google Docs or Reedsy Write for free on the cloud, get a Microsoft Office licence or buy every writer’s favourite: Scrivener. The best option for you could depend on the type of your computer and on your other preferences. If you decide to go for a cloud service, you never need to worry about accidentally losing your work when spilling hot chocolate over your keyboard. However, you might lose functionality you’d get with other apps. Our two favourites are Reedsy Write (because the free beautiful epub export), and Scrivener (because of its organisational tools). If you’re writing professionally, you might want to invest into a dictation software. Spending long hours every day (or night) in front of the computer is not healthy, therefore many writers opt for dictation. Dictation software may come free (like Google Voice typing), but premium options worth paying for if you’re taking writing (dictating) seriously. We write about dictation software in detail here. Once you’ve finished writing, sit back and relax. For a week. Then start editing: read your manuscript with fresh eyes. Repeat, until you are satisfied with your manuscript: this is the point where you have to get somebody to read it and give you some suggestions. You basically have two ways to go: you can either hire a developmental editor, or find a beta reader or critique partner. Developmental editors not only check your grammar, but make major suggestions regarding your story line, style and structure. You might not find your ideal developmental editor at once: it can take time to find the person who not only knows your genre well, but also gets along with you. No surprise: hiring a developmental editor can be quite costly. A professional can cost around 40 USD / 1,000 words or more. The Society for Editors and Proofreaders recommends a 32.60 GBP (around 43 USD) hourly rate. Remember that underpaid editors might do a rushed job. We are in touch with a few professionals, or you can find one on Reedsy (if you sign up to Reedsy using this link, you get 30 USD off). If you don’t have a few thousands pounds for your first book, try finding a beta reader or critique partner. You can read about them in great detail here. If you decide not to hire a developmental editor, you can still hire a copy editor. Copy editors look out for bad grammar, and inconsistencies in your wording or in your story. They work meticulously on your text word by word, line by line to make your writing shine. Copy editors are even more important if English is not your first language or if your book has been translated. It is not only us recommending that you hire an editor: Orna Ross, director of The Alliance of Independent Authors thinks that having an editor is absolutely crucial for every writer. We can provide copy editing for 20 USD / 1,000 words, or you can look for an editor on Reedsy (if you sign up to Reedsy using this link, you get 30 USD off). If you can’t afford an editor you have to take a few weeks off after finishing your manuscript to be able to read it with fresh eyes. You can find some golden rules for self-editing here. Nobody is perfect. Even if you have hired a developmental or a copy editor, you are recommended to ask another person to proofread your book. Proofreading requires a different mindset: proofreaders are little detectives with an impeccable eye for detail, spotting the tiniest errors. You are not sure if data is or are? You have no idea what to do with your quotation marks? Fear not. Your proofreader is there to make your book spotless. 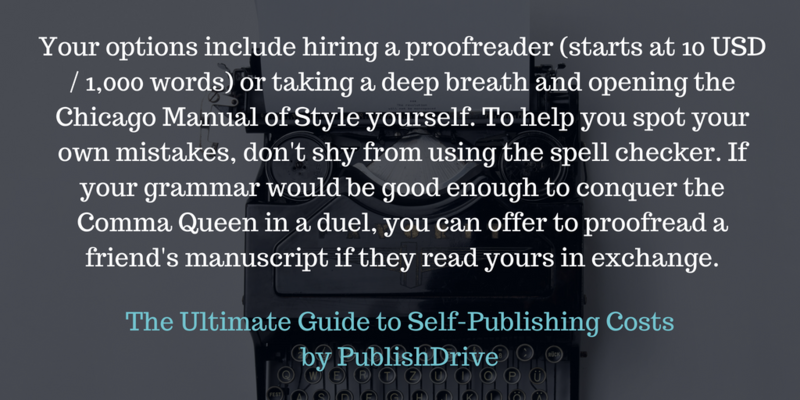 Your options here include hiring a proofreader (starts at 10 USD / 1,000 words) or taking a deep breath and opening the Chicago Manual of Style (or your favourite style guide) yourself. To help you spot your own mistakes (I have a few recurring errors in my writing myself), don’t shy from using the spell checker of Microsoft Word or Grammarly. Even the free version can do wonders. If your grammar would be good enough to conquer the Comma Queen in a duel, you can offer to proofread a friend’s manuscript if they read yours in exchange. Designing an outstanding cover is far more work than just choosing the right fonts and colors to make your cover look good. A book cover – that draws interest – demands high design skills and a high level of knowledge of Photoshop, InDesign or Illustrator. A good cover designer is not only a pro in Photoshop, but knows your genre well and is able to use your cover to help you position your book on the market. If you have some design skills (or are low on budget), you can try and design your own book cover. Click the link for step-by-step guides and descriptions to help you. However, it is much recommended to hire a designer. You might be an amazing writer, but there are only a few people who are good at everything they try. You can find one on Reedsy, on Fiverr. Indie author Joanna Penn has an amazingly long list of cover designers on her website to choose from. If you are thinking of getting a print copy of your book as well, don’t forget to design or order your print cover layout as well. Whether you decide to go for ebook only or print on demand, you’ll need your layout sorted. You’ll need an epub for online distribution (this is a format all stores accept) and a pdf for print distribution. You have many options here. If you are using Reedsy Write, you get a print-ready pdf and a valid epub for free when you’re exporting your book. Alternatively, you can convert your ebook yourself using Sigil or Calibre. For print, most pros would go for InDesign: you have to pay for the software (and it has a steep learning curve), but if you have many books to convert, it could be worth it. If you can’t invest your time into learning how to do it properly (for example if you’d rather spend your time writing your next book), you can hire a designer on Reedsy or on Fiverr. ISBN is a unique identifier which helps stores identify a specific edition of your book. For example, you’d need a separate ISBN for your ebook and your print copy. Traditionally, all books needed one, but ISBNs are no longer a must for self-publishing ebooks. Click here to read more about ISBN. You most likely don’t need an ISBN for your ebook. Most stores assign their own identifiers to your book (eg. Amazon is using ASIN), or accept ISBN-like identifiers (like PublishDrive’s own identifier, PUI). If you go through any aggregator, they’ll arrange an ISBN or other identifier for you. If you decide to go for an ISBN, you have to contact your local (national) ISBN agency. In some countries, it is free. In the USA, you have to get one from Bowker for 125 USD. In most countries, it is still a legal requirement to get an ISBN for any book in print. Even where it isn’t, the majority of bookstores don’t accept books without ISBNs. If you want your book to be in distribution (to be available in bookstores and libraries), you need an ISBN. Stores need a standard identifier to identify your book in the catalogue, order stock, report sales and keep track of different versions. For example, books with a paperback and a hardcover version have two ISBNs, so stores are able to track which one was sold. (Actually, most barcodes on books contain the ISBN for best results.) If you go through CreateSpace, for example, you can choose CreateSpace’s free identifier which is only valid on CreateSpace. You’ll need to pay 99 USD for an ISBN that is accepted worldwide. Unless you have only written a book to admire it yourself, you must have already thought about distribution. Getting into bookshops, being available on Amazon or iBooks, asking your librarian to order it from OverDrive… But does distribution cost money? Good news is: no. Ebook distribution usually does not have upfront costs. If somebody asks for upfront payment in return of ebook distribution, you should be worried. (One exception is IngramSpark: they have a 25 USD setup fee per title for ebook distribution, but they are a trustworthy company nevertheless.) In most business models, ebook distribution costs you a chunk of your royalties. You can approach stores directly or go to an aggregator to manage all of your stores together. Depending on the business model, you are most likely to earn between 75-50% of your sales as royalties. Print distribution traditionally is a huge investment: you had to print thousands of (or hundreds of) books, then pay for storing and shipping your books. With print on demand, print distribution will no longer cripple you financially. When somebody orders a copy, your distributor will manage printing and shipping: you just have to sit back and relax. For this service, you usually have to pay for title setup and/or a yearly fee to keep your books available in the catalogues. In other models, you pay a share of your royalties for the service. There is no “good” or “bad” option: it depends on your circumstances which one would be more suitable. By the time it comes to marketing, many people are low on budget – if they had a publishing budget at all at the first place. Building a website, running ads on social media, paying for a BookBub promo: these often cost money. Money you have already spent on editing or cover design. But does book promotion have to be a catch-22? Not at all! There are many things you can do to promote your book for absolutely free. For a long time, being discoverable on the internet meant having a website. Although it is no longer the case, many authors still decide to have a website for various reasons. In addition to WordPress.com, which is a free option for everyone who wants a blog, many authors have a Facebook page and an Amazon Author page. To get an actual website, you have to pay something for hosting and domain – Bluehost is a low-cost option for running WordPress based websites. Luckily for all of us, social media is (currently) absolutely free. You just have to invest your time into building valuable relationships. Read about establishing a social media presence here. On Facebook, the cost per click and cost per impressions varies depending on your audience, industry, country, among many other things. So how do you know how much to spend? The good thing about ads is that they cost exactly as much as you have for them in your budget. You can get started with as much or as little as it may, even 10 USD. On Amazon, you can start advertising from 1 USD. Minimum cost per click is 0.02 USD. Read more about using AMS ads for ebook promotion. BookBub is currently considered the Holy Grail of book promotions. It has an immediate effect on sales and many authors report positive long term effects. The cost of a promo depends on your book’s price, genre and on whether you’re running a US only or international promo. Politics, African American Interest and LGBT authors can get a promo for 62-70 USD, but writers of Crime Fiction or Historical Fiction have to pay around 430 USD for a 0.99 USD book. Can you self-publish for free? Yes, you absolutely can. But some things are worth spending money for, if you can afford it. 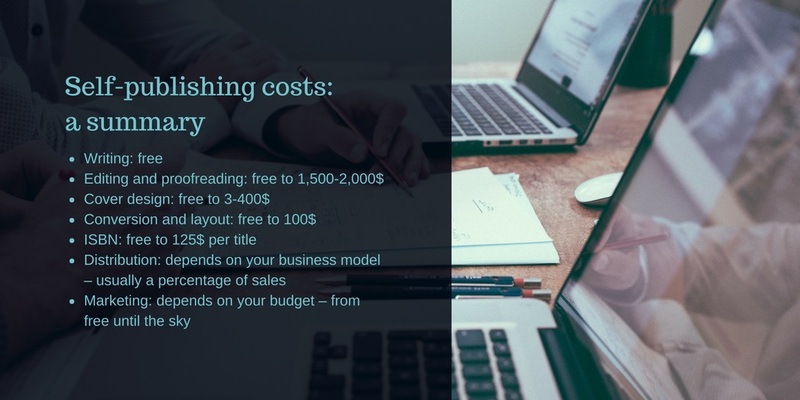 Total costs of professional self-publishing can add up to 1,5-2,500 USD.